Lauren John is BayNet’s newest board representative for special libraries. A librarian for the San Francisco’s Town and Country Club, she organizes monthly literary discussions and leads book groups. Her groups have appeared in public libraries, bookstores, boardrooms, museums, living rooms, retirement communities and synagogues. At Infopeople, she has taught librarians how to run book discussion groups and is the author of Running Book Discussion Groups: A How To Do It Manual. How did you decide to become a librarian? I originally thought that I would be a journalist and I took lot of writing and media classes in college at the State University of New York at Binghamton, which I attended from 1974-1978. In my media and society class in my senior year, I wrote a paper about the 1938 War of the Worlds radio broadcast that Orson Welles did on Halloween night. In the broadcast he announced that Martians had invaded New Jersey. Preposterous as that sounds today, people believed him and there was widespread national panic. The paper that I wrote was about how and why people believed the broadcast. I went to the university library looking for answers, and the reference librarian there (wish I could remember her name) told me that I could go back to the newspapers for 1938 and read the news accounts of the broadcast and the reactions to it in the editorials. I spent hours and hours in the library looking at primary source documents on microfilm – fascinated by the letters to the editors and also sidetracked by the fashion ads. I soon realized that I was hooked on the research as much as the writing. (The paper got an A). When I graduated from college, still unsure of what I was going to choose as a career – I took a summer class at St. John’s University School of Library Science in Jamaica, Queens. The class was about the publishing industry and the teacher was Patricia Glass Schuman – who later founded Neal-Schuman publishers. I loved the class and enrolled in the MLS program in the Fall. Note – Neal-Schuman published my book Running Book Discussion Groups in 2006. What is it like working at the Town and Country Club and what do you love about it? The Town and Country Club is a women’s social club that was founded in 1893 by the society ladies of San Francisco. It was founded for purely social reasons – to give women a place to lunch together, rest up between shopping and social engagements and dry off from the rain in winter. But the ladies were educated as well as social and the library was there from the start. Each new member was asked to contribute a book to the library. A big part of the job is hospitality – greeting members by name, getting to know them and their reading tastes, and making people feel comfortable and welcome in the library. Another part is anticipating what they will want to read – and knowing who wants to read about the Bush family and who wants to read about the Obamas. My favorite activity is the once a month book selection committee. Our library, which takes up three rooms on the second floor of the club, holds 10,000 volumes of fiction, mysteries, biographies, travel, and history books and has a strong California collection dating back to pioneer days. We buy fifteen new books in all categories each month – and weed out the collection once a year. The book selection committee consists of about fifteen very intelligent, well read women. They present mini-book reports in different categories and then we vote on all of them with the top fifteen then purchased from Book Passage, an independent bookstore in Corte Madera. I love hearing their book reports and learning about their interests which range from world travel to California history to political biographies to the latest fiction and thrillers. There was a huge debate over whether we should buy Sarah Palin’s biography–Going Rogue. (We did). Some members mail books we can’t get yet in the United States, like the Stieg Larsson (Swedish) The Girl Who Kicked The Hornet’s Nest. With some sixty books presented each time, I feel caught up on the publishing world! After book selection, many people stay and have lunch together – and I get to join them. What made you start running book groups? Long story short – In 2002, Susan Holmer, the then new director of the Menlo Park Public Library, asked me to fill in for a long time leader who had left. I was working as a on-call reference librarian at the time and enjoyed talking with patrons about what they were reading – and I lived within walking distance of the library, so I spent a lot of time there as a patron as well as an employee. I was also friends with the community services manager Roberta Roth, and attended and enjoyed lots of her programs. So I think I was asked because I was a chatty librarian with a good sense of the community. I didn’t know if I would be a good book group leader or not – but it was worth a try. I have been doing it ever since both at the library, in private living rooms and in community centers – all with great joy! How has the Web impacted the way that book groups are formed? Well for one thing, I don’t send out meeting postcards anymore! The Web and e-mail have been great for publicizing the group. Book group programs are posted right on the library Web site, and members can sigh up for e-mail updates. I also have The All Seasons Book Group blog aimed at all kinds of readers and book groups. 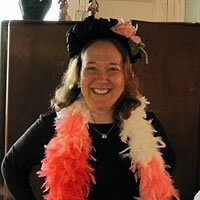 The site is hosted on a free writer’s site called Redroom: http://www.redroom.com/author/lauren-john. Just this year, more and more book group members are bringing their IPhones and Blackberries to book group – and are factchecking or using their devices to answer factual questions that come up. Eg. Was Doris Kearns Goodwin fined for plaigerism? Was Swedish author Stieg Larsson murdered? (he was not). And members are not shy about dashing off notes to each other in between meetings via e-mail and the blogs. What was the most memorable experience you had as a librarian or a book group leader? Well the worst thing that I ever did, happened about 25 years ago when I was a reference librarian at the Price Waterhouse accounting firm in NYC. At the end of a very long day, a patron telephoned for me to look up a bond price (this was way before desktops, laptops, or online pricing services and we had to do it by hand via looseleaf services). I put the patron on hold, got distracted, forgot about him and went home. My supervisor picked up the phone when she saw the flashing light. She had a sense of humor and did not fire me. But note that I am no longer a corporate librarian. I did, however, marry a Price Waterhouse guy who came into the library to train us on how to use Lotus 1-2-3 spreadsheets. (Anyone remember those?) If you want to know what our courtship was like, Netflix the move Desk Set! The best thing that has happened has been the opportunity to lead panels and discussions with authors and readers at book festivals including Book Group Expo, The Carmel Festival of Arts and Ideas, and Litquake. Any advice for a shy but voracious book reader to join a book group? You could start with a book group that meets in a public place, like a library, bookstore or community center. That way, if you are not comfortable, you are not as obligated to stay through the entire meeting – as you might be if you were meeting in someone’s living room. Get in touch with the book group leader before you come to the first meeting to get a sense of the group – the demographics and their reading taste. And if you just want to sit back and listen the first meeting, let the leader know that. On the other hand, it would be great if you felt brave enough to share one our two thoughts – or as an opener – ask the group a question. If you are a good cook or baker, you can always make new friends by bringing brownies! What do you hope to accomplish as the BayNet’s special library representative? Well, personally, it has already been an eye-opener to see the wide breadth of librarians that are represented. I hope to visit some more of their libraries and invite members to see my library at Town and Country Club on Union Square in San Francisco. With my writing skills, I hope to be working on publicity and marketing. Also, if we could agree on a book, would love to lead a one time BayNet Book discussion!